Best Garden Trowel: Dig in to A More Fun Gardening Experience! Whether it’s because you just love flowers or you just like to kill time, holding the best garden trowel in your hands after spending ages searching for it and looking over your plants that are well-maintained after hours and hours of hard work, you can’t help but think that gardening is definitely one rewarding past time! That is, as long as you aren’t struggling more than necessary and creating more mess than when you started, of course. Even if all you have is a small box garden that you’ve decided would look good on that one windowsill, there’s a lot of thought and planning that go into a garden! You have to think about what to plant, where to plant them, how to go about doing that, and what tools you need. Well, for starters, we’d like to say that, arguably, having the right tools for the right jobs is the difference between a hot mess and a flourishing garden. Admittedly, however, acquiring tools isn’t that easy. After all, what features should a tool have to be considered the best garden trowel? But don’t worry, this short series of reviews aim to help you find the one suited for you and your garden’s needs. So, let’s go ahead and dig in! Fiskars Big Grip Trowel comes with an extra-large handle made with Softgrip technology for a comfortable, easy grip and excellent control. The Softgrip handle reduces hand fatigue, which goes a long way towards speeding up your work and giving you a happier gardening experience. This Big Grip Trowel from Fiskars is ideal for digging, turning the earth, taking up plants, weeding, aerating, and more! It features a sharpened blade edge that easily cuts into even the toughest of turfs! The Big Grip Trowel features an extra-large aluminum head that’s made to resist rust and is tough enough that it won’t snap off even when you’re working on the tough soil. Relax in the knowledge that whether you’re digging, transplanting, or anything else, your trowel can withstand it, and you won’t be left in the dirt! When you’re exhausted after a good day of gardening, the last thing you need is to have to think about where you’re going to keep all your tools! Well, Fiskars Big Grip Trowel gives you an easy storage solution in the form of its hang holes at the handle. Just hang it on a hook on your garage, and you’re all good! The Garden Guru Lawn and Garden Tools Super Hand-E Garden Trowel is your go-to tool. It can be used for planting, transplanting, digging, weeding, mixing soil and compost, and more! It is sturdy and durable, making it well-suited not just for the garden but other outdoor assignments as well! Think of any other reason you would need to dig up soil, and the Hand-E garden trowel will have your back! The Hand-E Garden Trowel has a large, thick thumb rest on the top of the tool and finger grooves on the bottom specifically designed to give you the best grip possible! It’s made to reduce hand stress and fatigue, allowing you to comfortably work on your garden as long as you need to. The Hand-E Garden Trowel is explicitly designed to withstand anything you can throw at it! It features a thick, rust-resistant blade made to be durable. The blade is wide and concave to give you an easy time when gardening, and also to better handle tough soil! ONE TOOL ALL GARDENERS USE - Planting, transplanting, removing stubborn weeds, mixing soil and compost or scooping fertilizer, the Hand-E Garden Trowel is the Gardeners Go To Tool. POLISHED STAINLESS STEEL - Rust Resistant Blade is Thick for Strength and Durability, Wide and Concave for Scooping, Properly Designed for Professional Grade Applications. COMFORTABLE ERGONOMIC HANDLE - Large and Thick with Thumb Rest on top and Finger Grooves on bottom. Well Designed for those in search of an Agreeable Grip that Minimizes Hand Stress and Fatigue. NOT JUST FOR GARDENING - Strong, rugged and well suited for nearly all outdoor assignments. Placer mining for gold, metal detecting for lost treasure or camping with friends, this trowel will come in handy for all your digging purposes and you will be glad to have it stowed away in your backpack. GUARANTEED FOR LIFE - If there are any unexpected issues with any of our products, we have you covered. We are on call 24/7 to assist all customers and we guarantee to correct any problems fast and hassle free. No confusing, legal ease, run around...guaranteed! 100% Customer Satisfaction, plain and simple. The DeWit Forged Hand Trowel is designed not just to be durable but also lightweight to reduce any hand strain or fatigue. With high-quality Swedish Boron Steel and European Ash hardwood, you can rest assured that despite being light and easy enough to carry around, it’s also made to last! The DeWit Forged Hand Trowel was made with the goal of making your gardening chores quick, easy, and comfortable. The entire length of the DeWit Forged Hand Trowel blade is sharpened precisely and is ideal for many tasks such as planting, cultivating, aerating, weeding, and more. It was hand-forged and made to last, so don’t worry about putting it to the test on tougher soil! Touted as the best designed trowel on the market - a must-have for every gardener! When something works, you don’t really want to mess around with the formula. And this is definitely the case for the humble garden trowel! 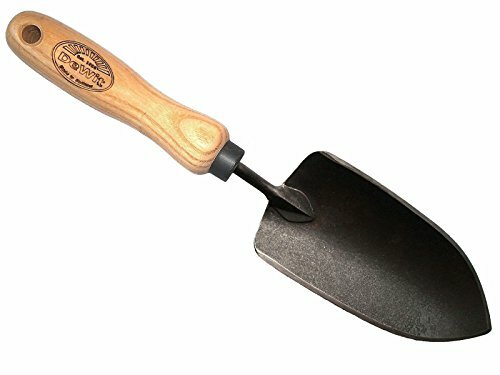 While you can easily tell the difference between a good garden trowel and a bad one–here’s a hint: one will leave you happy and tired with a gardening job well done, the other with a sore hand and sometimes broken pieces along with a mess of soil–there isn’t much variety among them. All three garden trowels have the features that you want your tool to have, and these are comfortable, durable, and work well! While all three of them get the job done, the best one is the Garden Guru Lawn and Garden Tools Hand-E Garden Trowel. It’s the perfect trowel, and it’s something that even people who have never used one before can quickly get accustomed to! It’s large enough but not unwieldy. It’s also durable and comfortable enough that even a clumsy beginner won’t have to worry about straining their hands too much! Again, these three garden trowels are good examples of what to look for in one. We only hope that even if none of them are your cup of tea, they’ve at least given you an idea of where to start! Good luck!